Before we know it, we will all be lounging by the pool basking in the warm sunshine of summer and drinking some tropical drinks with little umbrellas in them. We have had a very mild winter here in Kansas, so maybe it is easier for me to imagine that than some of you. I for one am beginning to think about swimsuit season, which at this point is a little terrifying. Well, here is a protein-packed dish that will get you on your way to the skin-baring summer months. I felt it was the least I could do after sharing my Loaded Mashed Potatoes last week. Top the wraps with your favorite veggies. I love the crunch that they give these. Cook ground beef in skillet over medium heat with the garlic and red pepper flakes. When browned, drain well and add the plum sauce, hoisin sauce, rice wine vinegar, ginger, and sesame oil. Cook for a few minutes to allow the flavors to blend. Add the coleslaw mix, carrots, and water chestnuts. Continue cooking about 5 minutes until coleslaw mix is crisp tender. Spoon into the lettuce leaves. Top with shredded carrots and sliced red bell peppers if desired. I looove me a good lettuce wrap! There’s just something about the warm, seasoned beef with all those crunchy vegetables. Looks delish Kim. 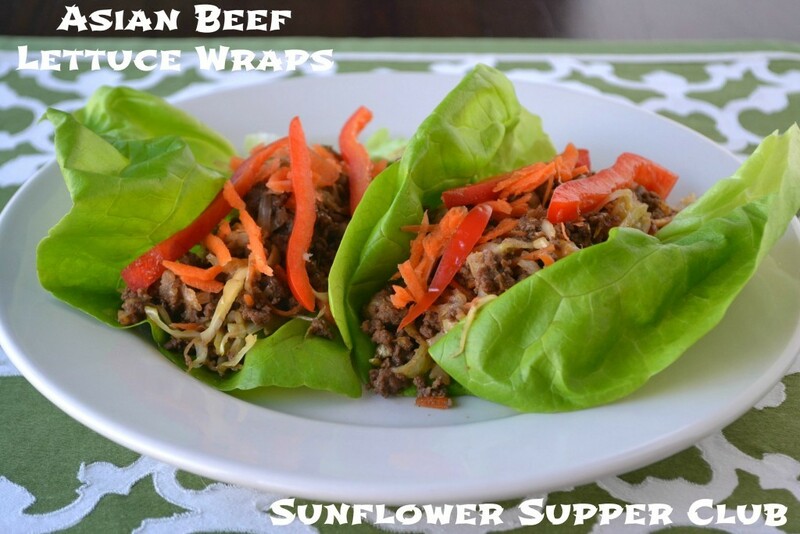 We have become big fans of lettuce wraps (my husband is eating low carb). Thank you for a new wrap option. Visiting from Recipe Sharing Monday.